Total Phase offers a line of tools that are well-suited for both simulating and monitoring I2C traffic. Our tools can be used in a number of applications, including automotive. Our Promira Serial Platform and Aardvark I2C/SPI Host Adapter can be used to simulate the head unit in a car, while the Beagle I2C/SPI Protocol Analyzer can non-intrusively monitor I2C traffic sent from the head unit to the A2B master. A2B traffic is transmitted into superframes that are categorized into upstream and downstream components, where they are sorted into sync control frames followed by data, and sync response frames followed by data. These frames include data packets including I2C, GPIO, and I2S/TDM. Using a Beagle I2C/SPI analyzer, it is possible to record the I2C traffic sent from the head unit to the A2B master for configuration and then replay the traffic via a Promira Serial Platform with I2C Active - Level 1 Application or Aardvark adapter, allowing the system to be fully emulated in a lab environment. 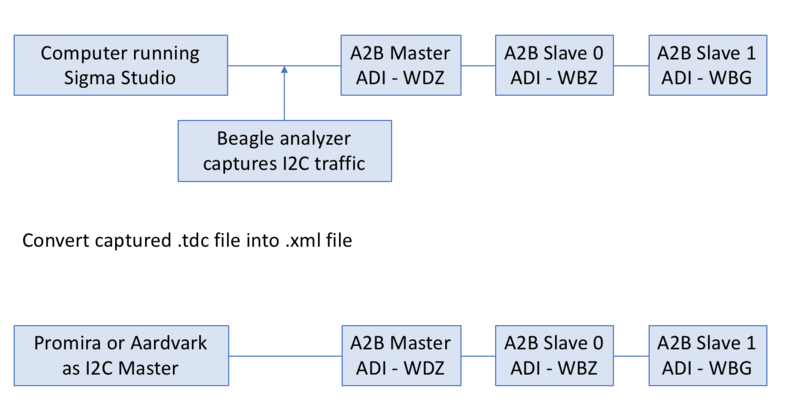 Then using the Promira platform with the A2B Bus Monitor – Level 1 Application, it is possible to monitor the A2B traffic between the A2B master and slaves. 1) Set up your head unit that will be used to configure the A2B master. (We have used SigmaStudio in the demonstration). 2) The ADI-WDZ board will be acting as the A2B Master that will be receiving the simulated commands and translating them into A2B data that will control the A2B slave devices. 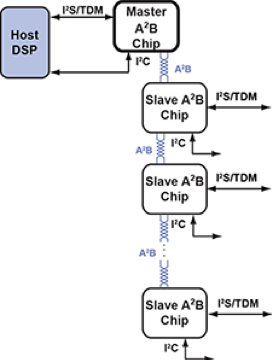 We will be using boards ADI-WBZ and ADI-WBG to represent the slaves. Connect the master to the host computer and the slaves to the master, respectively. 3) Connect the Beagle I2C/SPI Protocol Analyzer that will be monitoring the I2C traffic to the line and open the Data Center Software. 4) Start the SigmaStudio simulation and run the Data Center Software concurrently to capture the read/write communication between the devices. 1) Once the simulation has ended and the I2C traffic has been captured using the Beagle Analyzer and Data Center Software, you can export the data as an XML file. 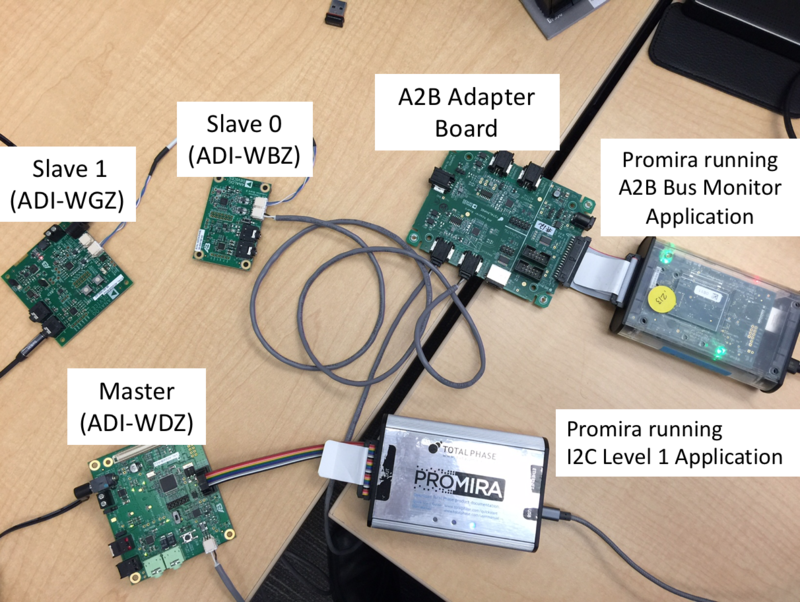 1) Use the Promira Serial Platform with I2C Active – Level 1 Application or Aardvark I2C/SPI Host Adapter to emulate a head unit that that will be providing the I2C data to the A2B master using the captured data from the previous step. 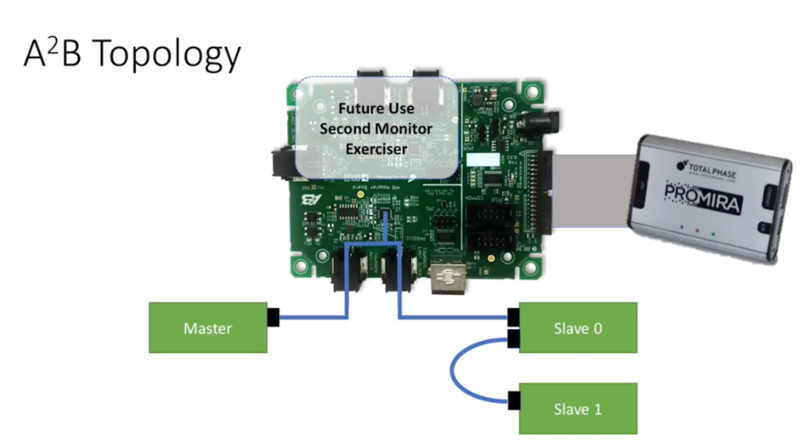 Connect your I2C host adapter to the A2B master and connect the A2B slave devices to the master device, respectively. 2) Open the Control Center Software and connect the I2C host adapter to the software; Initiate the Batch Mode feature and upload the XML file with the previously captured data. 3) The data from the XML file is now ready to be sent to the I2C host adapter device acting as the head unit. 1) To set up the A2B bus monitor, connect the Promira with A2B Bus Monitor - Level 1 Application to the A2B Adapter Board using a 34-pin ribbon cable. 2) Connect the A2B master into one port on the A2B Adapter Board and connect A2B Slave 0 into the other port. The I2C host adapter should still be connected to the A2B master. 3) Open the A2B web application that will be capturing and displaying the A2B data in real time. Run the capture. 4) Run the XML file in the Control Center Software to begin the head unit emulation. View a live demo of the A2B bus monitor in action here.